Today's new bird in our annual Birdorable Bonanza is an Old World species of duck: the Common Pochard! The Common Pochard is a migratory duck found across parts of Europe and Asia. They are gregarious, found in large (sometimes mixed) flocks during the winter. 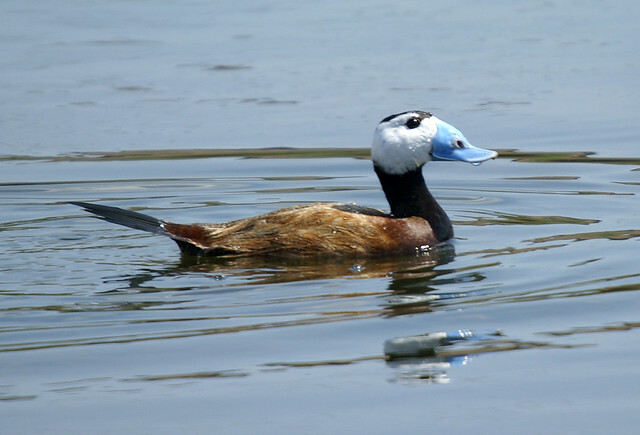 Common Pochards are known to occasionally hybridize with the Tufted Duck. Common Pochards look a lot like the Redhead of North America. 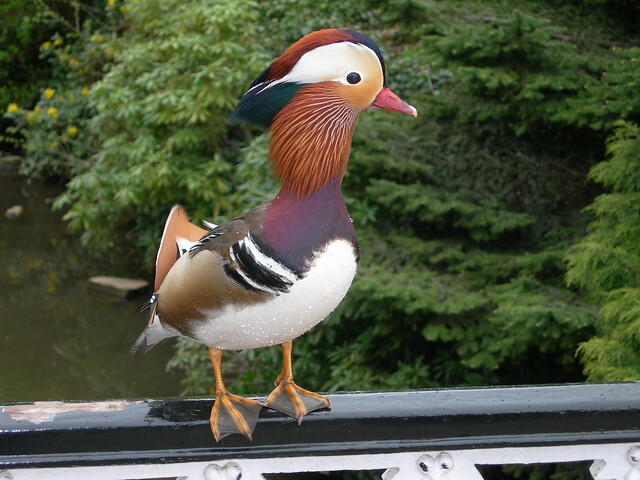 Adult males have light grey backs, black at the chest, and an unmistakable red head. Tomorrow we'll reveal a new member of the egret and heron family, known for its active hunting antics and for having two distinct color morphs. Can you guess the bird? 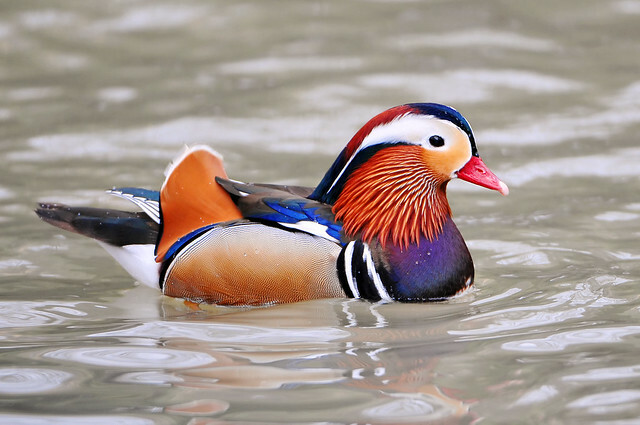 Our Birdorable Bonanza: 2015 Advent Edition continues today with a beautiful and colorful sea duck: the Harlequin Duck! 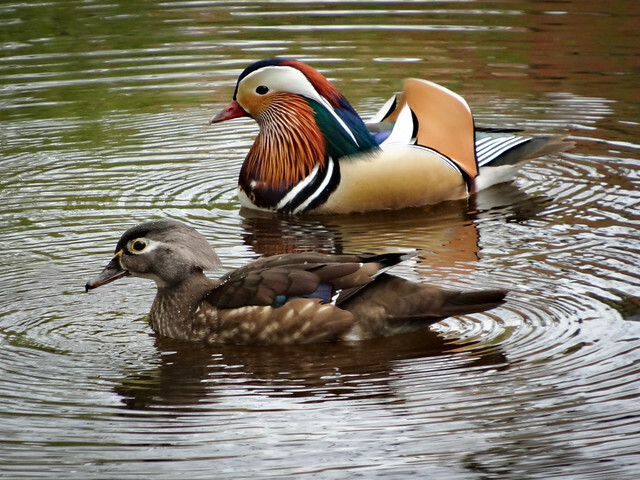 Harlequin Ducks are very beautiful sea ducks found along coastal waters across North America and eastern Asia. The species prefers fast-moving water and will frequently breed near fast-flowing streams. 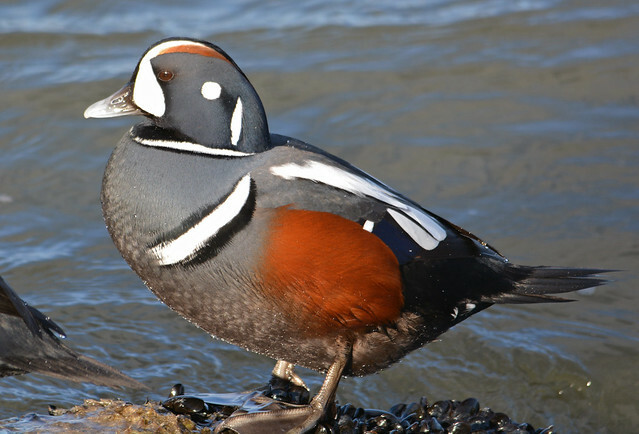 The male Harlequin Duck has a striking plumage for which the species is named. Harlequin was a colorful masked character from an Italian style of improvisational comedy theater called "commedia dell'arte". Harlequin was a relatively late addition to the art form, and was popularized when the theater movement gained success in France. The Harlequin Duck's colorful plumage gives it a lot of interesting alternative local names, including Painted Duck, Totem Pole Duck, White-eyed Diver, and Blue Streak. They have also earned the nicknames Sea Mouse and Squeaker from one of their more un-ducklike high-pitched vocalizations. Harlequin Ducks feed by diving or by dabbling. They will take marine invertebrates, fish, and aquatic insects as prey. Algae and seeds may also be consumed. 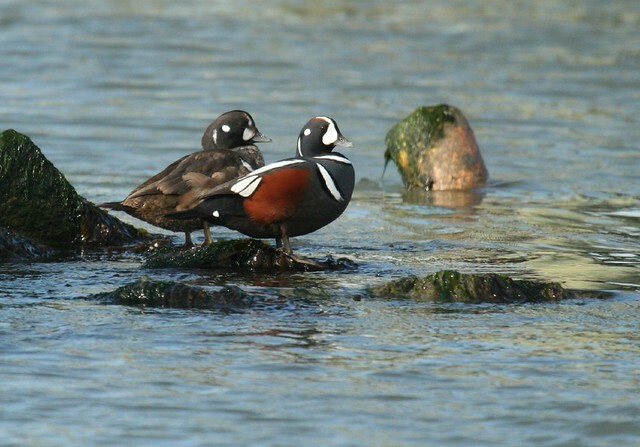 The Harlequin Duck is our 633rd Birdorable bird. Be sure to check out our collection of apparel and gifts featuring the Birdorable Harlequin Duck! Our Bonanza continues tomorrow with the largest bird of prey of Australia. Can you guess tomorrow's species? Our Bonanza hits the water today with our 477th species, the Common Goldeneye. 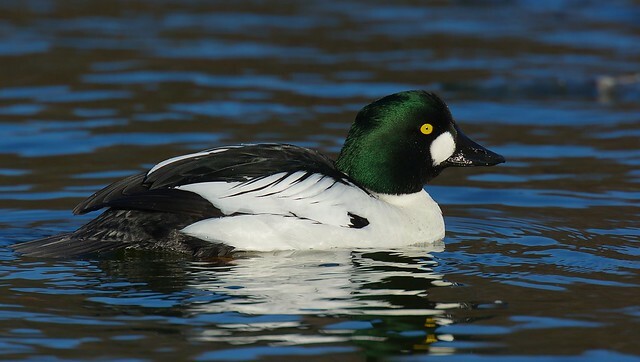 Common Goldeneyes are sea ducks with a broad global range. They breed across northern forests in Canada, Scandinavia, Russia, and China. They winter across much of North America and in parts of Europe and Asia south of their breeding range. Common Goldeneyes nest in tree cavities. They will also use nest boxes. When it is time to fledge, the ducklings leave the cavity nest and fall to the ground. Sometimes duckling goldeneyes may be raised by unrelated adults. This can happen one of two ways. First, female goldeneyes may lay eggs in the nests of other goldeneyes. Another familial mix-up can occur when females with ducklings get into territory fights with other families. As the adult female ducks fight, the ducklings can get mixed up. Once the fight is over and each family swims away, ducklings may end up with a different brood. Tomorrow we'll add a colorful species, named for the flower-like color of the male's head, found in India and Southeast Asia. Happy Independence Day to our American readers! Our 2013 Bonanza rolls on -- we're adding new birds each day in July until we reach our 500th Birdorable species! Today's Bonanza bird is the American Wigeon. 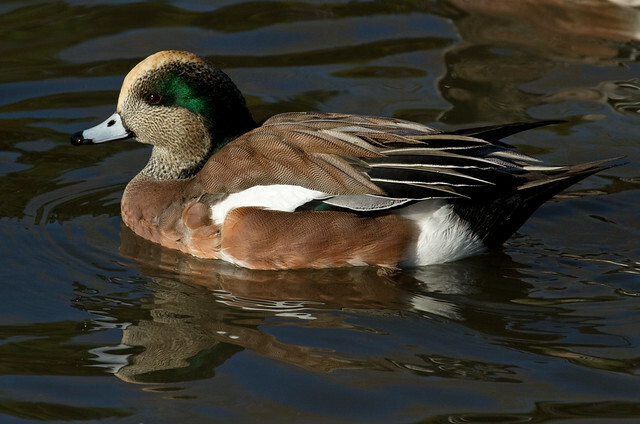 Male American Wigeons have beautiful breeding plumage, which includes a shiny thick green eyestripe at the cheeks and a white stripe running from the top of the bill up to the crown of the head. This stripe gives the bird a "bald" appearance. The species was previously known as the Baldpate (pate means head). American Wigeons are dabbling ducks, which means that they feed by grazing vegetation at the bottom of shallow waters. They are almost 100% vegetarian. Our next new Birdorable species is an over-sized kingfisher! Come back tomorrow to find out what it is!